Gulf Shores is accustomed to wearing two hats. On the one hand, it’s a small, tight-knit community known for its Southern hospitality and family-friendly atmosphere. On the other, it’s home to some of the most beautiful beaches in the U.S. that attract hundreds of thousands of tourists each year. But all of this was jeopardized when Gulf Shores became one of the most affected areas of the 2010 Deepwater Horizon oil spill. Instead of folding, however, the City of Gulf Shores saw an opportunity to tell millions of people about their community and its determination to be better than ever. Their website became one way to convey and spread that message. "At the end of the day, being able to offer a true resource to our residents and visitors is the most important thing for us as a government." Residents and municipal staff often found themselves frustrated with the lack of updated resources on the previous city website. But without a user-friendly content management system, it was nearly impossible for staff to keep information dynamic and fresh. 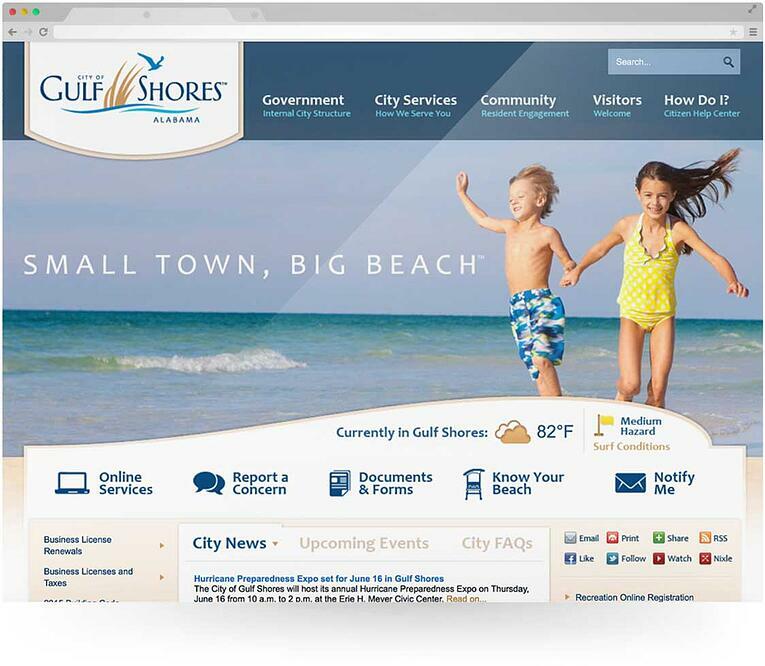 Looking to rebrand and revitalize the community, the City of Gulf Shores knew it needed a site that was not only visually enticing, but also highly functional. "This site has helped us turn a corner in showing what we’re really here to do as a local government, which is to provide services and resources to our residents and visitors." Today, visitors to the City of Gulf Shores’ website are greeted by gorgeous images of local scenery, reinforcing the city’s pride in its pristine beaches. More importantly though, residents now have the resources and services they’re looking for right at their fingertips. And because individual departments are able to easily and consistently update their pages, citizens can trust that the website contains only the most accurate, relevant information. 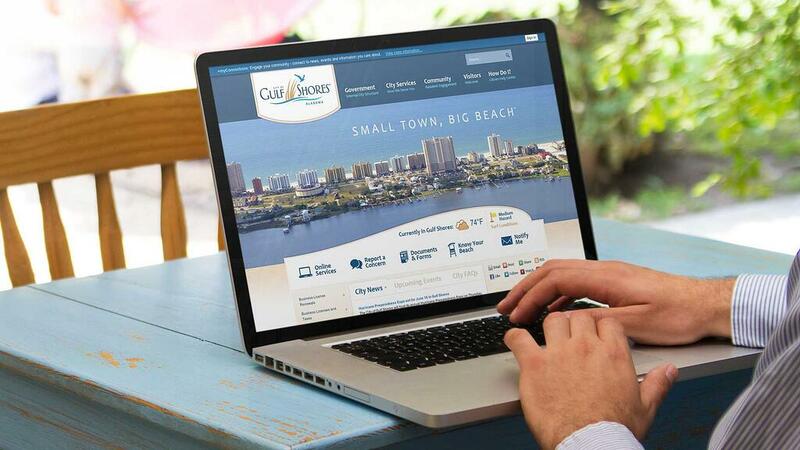 With web traffic continually growing, the City of Gulf Shores knows that residents and visitors alike are actually using the site in meaningful ways. 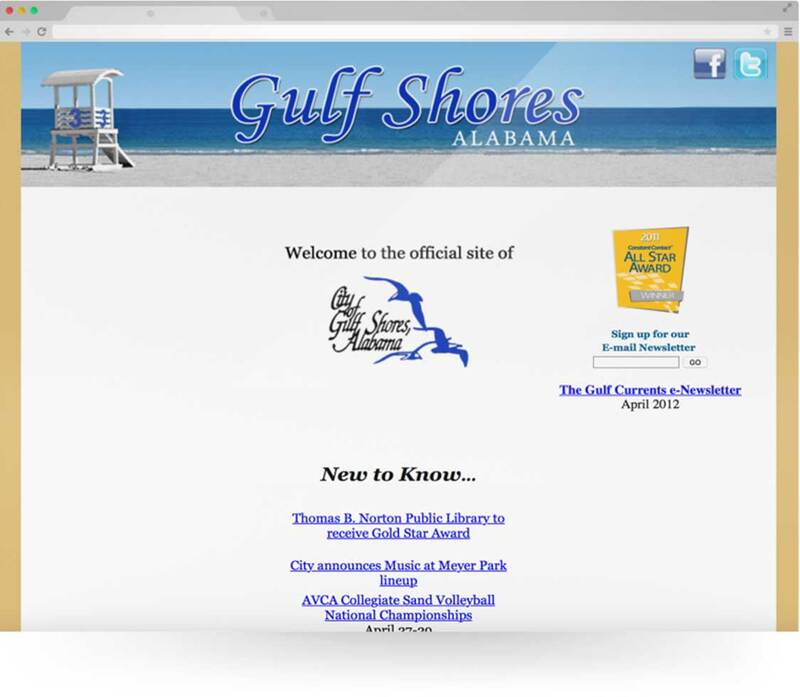 Whether its better serving its public, or showcasing the true spirit and beauty of Gulf Shores, the city’s website is allowing local government to exceed expectations. "I really feel like our website has allowed us to elevate the level of service we provide, and fight that common perception that local government, especially in a small town like ours, is unable or unwilling to provide the kinds of services that people have come to expect."